Fall trail run on the Tamworth side of Mt. Chocorua. Trail running in the White Mountains will prepare you for just about any trail. It is a little bit steeper, rockier and rugged than the rest of NE. 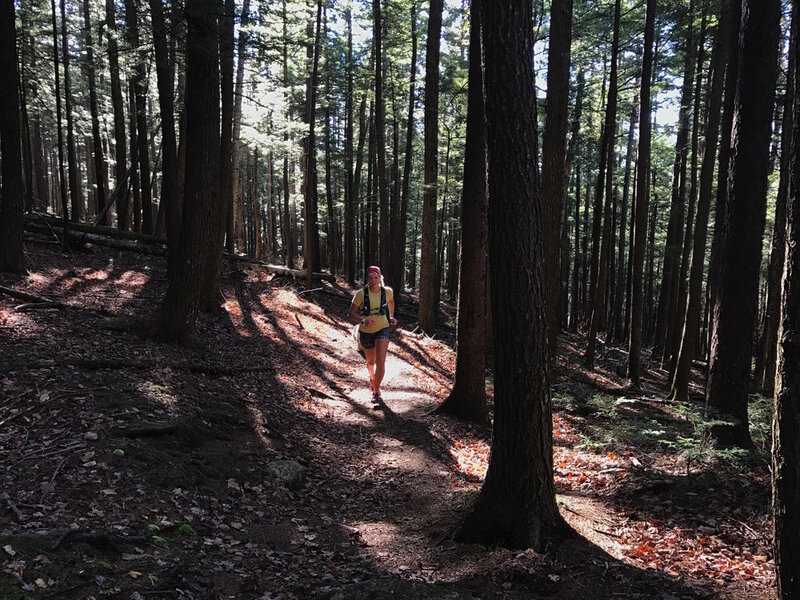 The focus for Backcountry Bliss's trail run retreat will be to showcase the various terrain - we can cruise along the Saco River on a soft, forgiving trail or head up onto a ridge for the view. We will be mixing up running when it's runnable and power hiking when the incline increases. Lindsay and Hilary have spent the last 3 springs running a class called Run Strong that instructs and trains local runners to be more body aware, stronger and more safe when they run. The combination of being Physical Therapists and passionate about education led us to these annual classes. We believe in teaching biomechanics, muscle anatomy and the physics to allow runners to understand why strengthening and mobility is so crucial to a long, healthy running career. The class is a circuits and yoga based program. We would be remiss if we did not incorporate these teachings into our Trail Run Retreat. We prepare fresh, homemade meals to replenish the system and give a taste of fall in New Hampshire. We will dine at the house for Breakfast and dinner while taking lunch with us on our running adventure for the day. We can discuss various types of nutrition that can we love for the trails to keep the glycogen stores up! We love Skratch and Untapped waffles! Sunday will be similar with one trail run and yoga mixed into the day.